I've been trying to write something but my cold affected brain refuses to work. So I decided to share a picture of polenta with scrambled eggs and mushrooms. 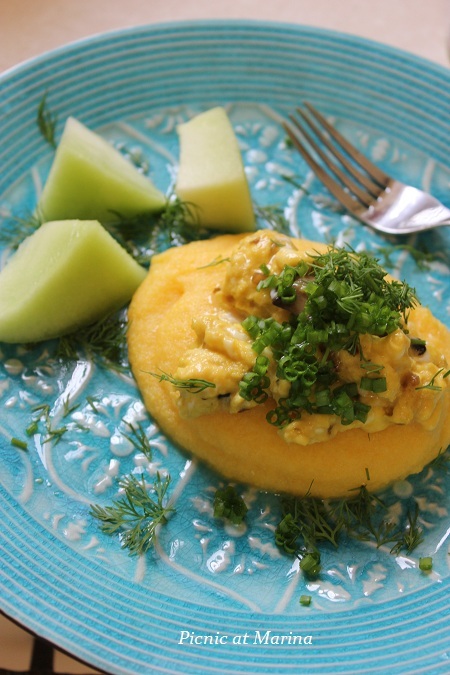 There's no recipe for this meal as it is easy: cook polenta, make scrambled eggs with mushrooms, and serve! You have a terrible cold too!!!! I wish it could end right now! I'm sure you felt better after eating this beautiful breakfast tought! Lovely breakfast idea. Sometimes I don't know what to cook for breakfast, everything looks the same-)) This is something interesting, because I don't cooks polenta that often. Must be heaven with eggs and mushrooms-) Thank you, Marinochka! I like the idea of this breakfast. I always enjoy polenta - I should really cook it more. Not to worry, Marina. I'm proof that it's only temporary. I'm not back to normal yet but I am starting to feel better. You will, too. Get some rest. Sorry you've been sick! There's really a nasty cold going around. Breakfast looks delish! Get well soon. Simple is always best. I'm sorry you've been unwell! Thank you for sharing...what a nice way to end my weekend (and get ready for dinner!) I hope you have a wonderful week! A cold can affected every part of your body, get better real soon. I hope you feel better Marina...the polenta for breakfast is sure a great idea. Happy 2013 and again feel better! Feel better! Breakfast looks delish! I hope you feel better Marina, we miss you so much! I think this might be the only combination I haven´t tried with polenta yet. Good breakfast!Feel better Marina!